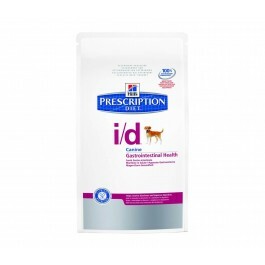 Hill's Prescription Diet i/d Canine is a complete balanced nutrition for growing puppies as well as adult dogs. It is recommended for gastorintestinal disorders - gastritis, eneritis, colitis, most causes of diarrhoea, malabsorption and bacterial overgrowth. In fact, i/d is clinically proven nutrition to settle digestive upset in as little as 3 days. This food aids recovery from gastrointestinal surgery and minor surgical procedures, and is also recommended for exocrine pancreatic insuficiency, acute pancreatitis and bloat. High digestibility - improves availability of nutrients whilst allowing for recovery of the digestive tract. Reduced fat - helps limit vomiting and steatorrhoea. Optimal blend of soluble &amp; insoluble fiber. Increased electrolytes and B-complex vitamins - helps replace losses caused by vomiting and diarrhoea. Added superior antioxidant formula - neutralises free radicals associated with gastroenteritis. 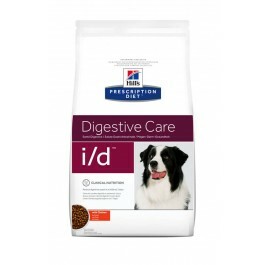 Hill's Prescription Diet h/d Canine should be recommended by your veterinary surgeon. For detailed information on feeding amounts and how this food can help your pet, please consult your veterinary surgeon. 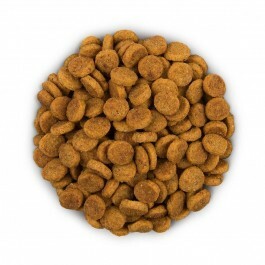 For the best results ensure a gradual transition to your dog's new food over a 7 day period. Exclusively feed the recommended Prescription Diet food and keep fresh water available at all times. Please note that this is a guide only and that individual animals may have different requirements. Adjust the feeding amount to maintain the optimal body weight and and divide into 3-6 meals per day. In acute pancreatitis, feed only after the initial stage during which all food and liquid by mouth are withheld. In dogs prone to bloat (gastric dilatation and volvulus), exercise and excitement near meal times should be avoided; ideally rest for at least 1 hour before and after feeding.